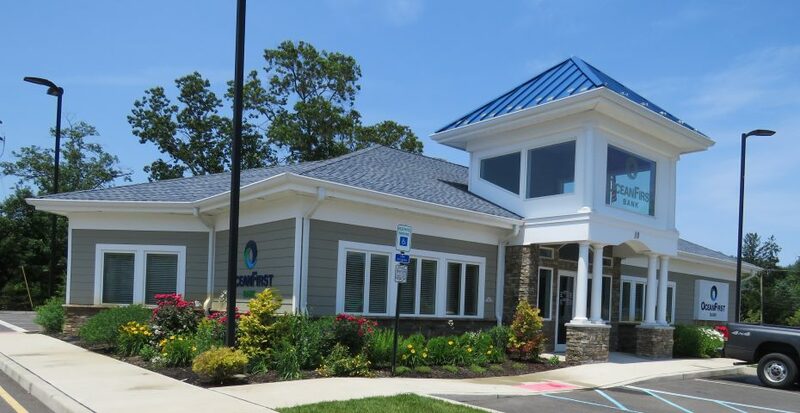 Leesville Road Branch in Jackson is the newest OceanFirst Bank Branch in Ocean County. Seven different garden beds around the perimeter of the building receive varying degrees of sun and shade. The Jersey-Friendly Yards website was used to select native perennials with varied bloom times to give the landscaping 3 seasons of continuous color. Blue Giant Hyssop (Agastache foeniculum), Eastern Bluestar (Amsonia tabernaemontana), Blue Wild Indigo (Baptisia australis), White Turtlehead (Chelone glabra), Sweet Fern (Compotonia peregrina), Gaillardia (Gaillardia sp. ), Blazing Star (Liatris spicata), Great Blue Lobelia (Lobelia siphilytica), Evening Primrose (Oenothera fruticosa), Foxglove Beardtongue (Penstemon digitalis), Moss Phlox (Phlox subdulata), Obedient Plant (Physostegia virginiana), Mountain Mint (Pycnanthemum muticum), Showy Goldenrod (Solidago speciosa), Foam Flower (Tiarella cordifolia).